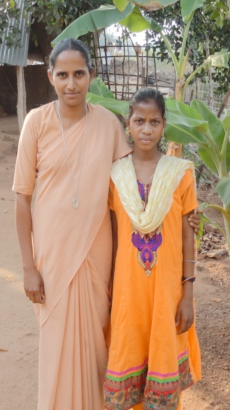 This is the story of Subatha Raitha, a 12 year old girl living in Dundrum village, in Jubo Odisha. Her general health was very poor and the very sight of her invoked compassion. Sabbath was becoming weaker day by day. She was frightened to go to the hospital for a check-up or to take any treatment. Finally Subatha was unable to take any liquids or food on account of severe vomiting. With Subatha’s health condition worsening, Sr. Rini, with her gentle ways, urged Subatha’s parents to get her to the hospital. After much struggle she was taken to the nearby government hospital where she was diagnosed with intestinal T.B. She began to be treated but due to severe vomiting she discontinued after a day. However, the Sisters did not give up. Through their constant intervention and nutritional support, Subatha began to recoup her health. She began to take her medicine faithfully. Now she has regained her health. You can see the radical change in her appearance in just two months. You need not have to be rich to be generous. ← Family of the Month – Vasarla Lakshmi – Sponsored!